Cortez V. G., Baseia I. G. & Silveira R. M. B. (2011) Lycoperdon ovoidisporum sp. nov. from Brazil. Lycoperdon ovoidisporum is described as a new taxon based on specimens collected in Southern Brazil. The diagnostic feature of the proposed new species is the shape of the basidiospores, which are ovoid, slightly verrucose-subnodulose under scanning electron microscopy and shortly pedicellate. A morphological description, as well as detailed illustrations and scanning electron micrographs of the basidiospores are presented, with a brief discussion and comparison with other members of the genus. 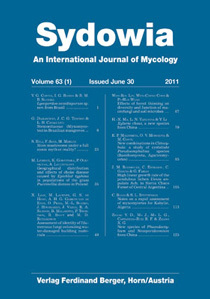 Keywords: Agaricales, gasteromycetes, Lycoperdaceae, mycobiota, taxonomy.